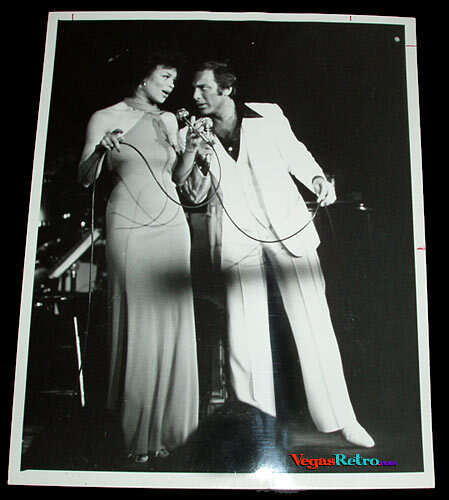 This 8x10 glossy print of Paul Anka and Odia Coates doing a duet in Las Vegas, came out of the Vegas Visitor files. The two singers made the charts with a duet called "(You're) Having My Baby" that went to No. 1 on the Billboard charts in 1974. Over the years they produced several more Top 10 duets, like "One Man Woman/One Woman Man" plus in 1975 "I Don't Like To Sleep Alone". The back has handwritten instructions for the printer that say: Good Times (the caption), 2 col, 55%, (the size it would run in the tabloid) and the date 12/31/76. The print is in excellent shape. I would like to purchase the anka duet photo with odia coates, but I can,t get it into the cart.